The Toronto Maple Leafs have a tough decision in front of them in net as head coach Mike Babcock and general manager Kyle Dubas must decide who will be their backup goalie as the team still has four goalies on their training camp roster, including starter Frederik Andersen, incumbent backup Curtis McElhinney as well as AHL stars Garret Sparks and Calvin Pickard, according to Kevin McGran of the Toronto Star. That could be a bigger decision than thought despite the solid season that McElhinney had last year. The 35-year-old posted a 2.14 GAA and a .934 save percentage in 18 games last year, but is on the final year of a team-friendly contract ($850K) and could conceivably cost the team, expected to have cap problems starting next season, quite a bit next season. Sparks, on the other hand, will just be a restricted free agent next season after posting impressive numbers for the AHL’s Toronto Marlies, the Calder Cup champions, when the 25-year-old posted a 1.79 GAA in 43 games with a .936 save percentage. Pickard, thought to be the future of the Vegas Golden Knights, is also on the roster. The fear is the team would likely lose Sparks if they place him on waivers to send him to the AHL, which might force the team to decide which player they would rather have, not just this season, but as their future long-term backup. Pickard, who was a backup in Colorado two years ago, could also be lost as well if they decide to place him on waivers. McGran, in the same story, adds that the Maple Leafs are also looking to trade a few of their players, most notably defenseman Connor Carrick, who the team fears they will lose if they place him on waivers. Carrick got into 47 games last season, posting four goals and 12 points, but could be highly coveted by teams with defensive issues such as the Vancouver Canucks or even the Detroit Red Wings. The Detroit News’ Ted Kulfan writes that veteran defenseman Niklas Kronwall tweaked something in practice and now is questionable for the team’s season opener, joining Jonathan Ericsson and Trevor Daley as questionable for Thursday. Mike Green is already considered out. With those potential losses, Detroit will have to depend on their plethora of young defensemen to fill in. Detroit Free Press’ Helene St. James writes that defenseman Dennis Cholowski has already won a spot on the team’s defense, but Filip Hronek, Joe Hicketts and Libor Sulak all could stay depending on those injuries. While there is no specific word on whether or not he’s made the Tampa Bay Lightning, it’s expected that rookie Mathieu Joseph is a top candidate to make the team, according to Tom Jones of the Tampa Bay Times. Joseph stands out the most with a preseason high of four goals. The scribe describes Joseph as a future star, who could come out of no where such as Brayden Point. The Detroit Red Wings’ defense could look much different to begin the season than many expected. With top pair defenseman Mike Green already shut down and confirmed to be out for at least the team’s opener due to a viral infection, coach Jeff Blashill revealed today that banged-up blue liners Danny DeKeyser, Jonathan Ericsson, and Trevor Daley are all considered questionable to begin the season. As Ansar Khan of MLive.com points out, it could be a very young, inexperienced defensive corps to start the year in Detroit. Niklas Kronwall and Nick Jensen could be the only regulars healthy enough to play, joined perhaps by a veteran like Brian Lashoff or Dylan McIlrath. Outside of those options, rookies will likely make up the rest of the top six. 5’8″ Joe Hicketts, who got a brief look last season, leads the way, with 2016 first-rounder Dennis Cholowski, second-rounder the same year Filip Hronek, and Czech import Libor Sulak in the mix as well. Injury news about Zach Bogosian usually isn’t good and unfortunately, this could be trending in that direction as well. Bogosian has been taking it easy in training camp, working his way back from major hip surgery, but the Athletic’s Joe Yerndon reports that he has still managed to get injured. According to head coach Phil Housley, Bogosian is day-to-day with a lower-body injury. Even worse, Yerndon notes that it is a new injury, unrelated to his hip issues. Bogosian’s career has been marred by frequent injuries and an inability to bounce back quickly. The Sabres have to hope that this case is different, as Bogosian and Marco Scandella will be needed to lead a young defensive unit and groom top overall pick Rasmus Dahlin. It didn’t take long for the New York Rangers to get clarification on Matt Beleskey’s status. After head coach David Quinn said yesterday that it was “too early to tell” the extent of Beleskey’s injury, suffered during a fight on Monday night, the Rangers released an update today. Beleskey will be out two to four weeks with a separated shoulder, the team determined. Since Beleskey was a likely training camp casualty anyway, the only change for the Rangers is that he cannot be placed on waiver while injured. Instead, he will be placed on the injured reserve with only a minor salary cap charge. Montreal Canadiens’ free agent addition Matthew Peca is currently sidelined. The team revealed that he is dealing with a minor groin injury. No timeline has been established for his return. Peca’s NHL ability and role for the Habs is still unclear, so missing preseason action and potentially the start of the season is unfortunate. The former Tampa Bay Lightning prospect will have to hit the ground running upon his return. The Detroit Red Wings have been without defenseman Mike Green since the Traverse City portion of training camp ended when Green complained of fatigue. However, the worst of it is behind him, according to Red Wings’ general manager Ken Holland, who says that according to a infectious disease specialist, Green is “on the backside” of a viral infection, according to Detroit Free-Press’ Helene St. James. While there is no firm timetable of a return, the team is preparing for the upcoming regular season without Green’s availability. The team will likely keep two of their four defensive prospects to open up the season for Detroit in Dennis Cholowski, Filip Hronek, Joe Hicketts and Libor Sulak. The Athletic’s Max Bultman (subscription required) handicapped each of the four blueliners chances of making the team. Injuries continue to plague Columbus Blue Jackets defenseman Ryan Murray, who has been out since Tuesday after getting kicked in between the legs in their preseason games against the Chicago Blackhawks. The Athletic’s Aaron Portzline confirms it’s not a back injury, which has been an issue with him in the past, but a groin problem. He suffered a soft-tissue groin injury and could be out between a couple to a few weeks. It doesn’t look like Philadelphia Flyers backup goaltender Michal Neuvirth will be ready for the regular season opener after injuring his groin on Friday, according to Philly.com’s Sam Carchidi. That likely means that the Flyers will start the season with Anthony Stolarz as the team’s backup to Brian Elliott, although Carchidi suggests that 20-year-old phenom Carter Hart is making a strong bid for the opening night roster. “There haven’t been many huge peaks or valleys in his play, and that’s a good place to start when you’re battling for an NHL job,” head coach Dave Hakstol said about the 20-year-old. The Athletic’s Corey Masisak reports that New Jersey Devils goaltender Cory Schneider expects to go to Europe with the team for a preseason game in Bern, Switzerland, on Oct. 1. “We’ll see where it goes from there,” Schneider said. The 32-year-old goaltender, who is recovering from hip surgery practiced with the team’s second unit today and stayed on the ice for extra drills with Keith Kinkaid. Michael Smith of NHL.com reports that Carolina Hurricanes forward Micheal Ferland is dealing with a lower-body injury and is day-to-day, but head coach Rod Brind’Amour said he will hold Ferland out of the lineup for the rest of preseason. While Avalanche defenseman Tyson Barrie has been involved in trade speculation for quite some time, it doesn’t appear as if they’re in any rush to move him. In his latest 31 Thoughts podcast (audio link), Sportsnet’s Elliotte Friedman reports that they’re only going to consider a ‘hockey deal’ for the 27-year-old which would take away the idea of a futures-based return. He adds that Colorado could wind up being fairly quiet on the trade front as they want to get a better read on the young core that they currently have, even if it might result in them taking a step back and missing the playoffs in 2018-19. While the Senators stated that they had offered a long-term extension to defenseman Erik Karlsson back on July 1st, the blueliner told Postmedia’s Michael Traikos that he hadn’t spoken to GM Pierre Dorion or owner Eugene Melnyk since November when the team requested his no-trade list. He wound up being flipped to San Jose earlier this month and while no extension has been agreed upon just yet, GM Doug Wilson stated that he’s “very comfortable with the situation”. If they want to work out a max-term contract though, they will have to wait until after the trade deadline on February 25th. The good news didn’t last too long for Red Wings defenseman Mike Green. Helene St. James of the Detroit Free Press notes that the blueliner is dealing with fatigue issues that have resulted in the team shutting him down for the time being. Head coach Jeff Blashill told reporters, including Dana Wakiji of the teams’ website (Twitter link), that the cause of the fatigue is a virus that has attacked his liver. As a result, his availability for the start of the season is now in serious question. GM Ken Holland indicated that four prospects will be pushing for what now appears to be two spots on the opening roster – Dennis Cholowski, Joe Hicketts, Filip Hronek, and Libor Sulak. The Hurricanes are expected to pick up extension discussions with winger Sebastian Aho in the coming days, GM Don Waddell acknowledged to NHL.com’s Tom Gulitti. While the two sides aren’t setting the beginning of the regular season as a deadline to get something done, Waddell stated that the team is hopeful to have an agreement in place by then. Aho has quickly established himself as one of Carolina’s top offensive weapons, leading the team in scoring last season with 65 points in 78 games. He’s entering the final year of his entry-level contract that carries a cap hit of just $925K in base pay (with an extra $850K in potential performance bonuses). Needless to say, the Hurricanes will have to give Aho considerably more than that to get him to put pen to paper on a new contract. Penguins head coach Mike Sullivan confirmed to Jason Mackey of the Pittsburgh Post-Gazette that they will experiment with using center Derick Brassard on the wing in the preseason. Brassard stated at the end-of-season exit meetings that he had difficulty adapting to playing in the bottom six; moving him to the wing would allow the team to put him on a higher line. If the experiment works, that would also help alleviate the small logjam the team has down the middle after re-signing Riley Sheahan as well as adding Derek Grant and Matt Cullen in free agency this summer and lessen the likelihood that they would deal from their surplus. Red Wings defenseman Mike Green will meet with the doctor that performed his neck surgery five months ago in the hopes of getting clearance to participate in training camp, notes MLive’s Ansar Khan. Even if that happens, Detroit may limit him in preseason action as a precaution. Green tried to play through the injury last season but struggled before the team shut him down in March. That didn’t seem to affect his free agency, however, as he still inked a two-year, $10.75MM deal late in June. 9:30 AM: The Red Wings have announced (via Twitter) that Green has signed his two-year deal. 7:36 AM: Craig Custance of The Athletic reports (Twitter link) that Vanek has agreed to a one-year, $3MM deal with Detroit. Saturday: While the Red Wings are believed to be in rebuilding mode, it doesn’t appear that this is stopping them from being active in free agency. On top of being expected to add goalie Jonathan Bernier tomorrow, TSN’s Darren Dreger reports (Twitter link) that defenseman Mike Green is staying put and that winger Thomas Vanek is also considering a return to Detroit as well. Green remaining in Detroit isn’t a huge surprise as the team has been actively trying to re-sign him over the past week or so, offering multiple contracts of varying term and money. It was reported earlier this week that the team was hopeful that they could lock him up on a two-year pact. TSN’s Bob McKenzie reports (via Twitter) that the deal will carry a $5.375MM AAV. His re-signing would take arguably the most prominent defenseman off the market before the market even opens up. Green ranked eighth on PHR’s Top 50 UFA list, one of only two rearguards in the top-10. He gives Detroit back their top offensive threat from the back end; he has led the team in scoring by a defender in each of his three seasons with the Red Wings, averaging 35 points per season. As for Vanek, he is quietly one of the highest scoring players in free agency this summer as his 56 points in 2017-18 rank third among all unrestricted free agents. That helped earn him the #14 ranking on our list. Despite his offensive performance in recent years, he has bounced around in recent years, playing for five different teams since 2016. One of those teams is Detroit, who initially signed him in the summer of 2016 after he was bought out by Minnesota. He fared relatively well as he posted 38 points in 48 games before being dealt to Florida as a rental player at the trade deadline. It wouldn’t be surprising to see if that was the idea they have in mind here as well although Vanek would certainly prefer to have a little bit more stability and security after moving around as much as he has lately. These moves would likely represent the bulk of Detroit’s offseason spending in free agency. While the team has a little over $20.5MM in cap space per CapFriendly, these three veterans would likely eat up half of that or more and they still have some notable restricted free agents to re-sign, headlined by center Dylan Larkin. The Detroit Red Wings weren’t able to trade the expiring contract of defenseman Mike Green at the deadline given his injury concerns, but now might not be losing him for nothing in free agency after all. Ansar Khan of MLive.com reports that the Red Wings are in talks with Green and believe they can sign him to a two-year contract. Detroit obviously could ink Green to a deal before Sunday since he’s still under their control, though there was expected to be plenty of interest in him on the open market as one of the better puck-moving defensemen available. Green is coming off a three-year, $18MM contract with the Red Wings he signed in the summer of 2015. Now 32 years old, Green is no longer the dominant offensive weapon he once was. Scoring 31 goals in just 68 games during the 2008-09 season, and followed it up with a 76-point campaign, he finished second in Norris Trophy voting in consecutive years. That incredible powerplay weapon may be gone, but Green can still contribute with the man advantage and be an effective puck-moving option at even-strength. He’s not as weak defensively as some may believe, and doesn’t require extremely sheltered minutes like other offensive-minded players—though he would likely excel if given them. The Red Wings, who recently bought out Xavier Ouellet and traded Robbie Russo, need someone to play defense for them even if some of their younger players are ready to take the next step. Niklas Kronwall, Trevor Daley and Jonathan Ericsson are all on the last legs of their careers and bring long injury histories, while Danny DeKeyser isn’t as effective as he once was. Re-signing Green would also keep an asset in the organization that could be valuable at the trade deadline, a strategy that could pay dividends if he’s not injured this time and doesn’t demand a no-movement clause. Green should have enough leverage for a fairly expensive contract, but the Red Wings have plenty of cap space to fit him in. Sitting more than $20MM under the ceiling, Detroit could be quite creative with free agents this summer. Andreas Athanasiou, Dylan Larkin and Anthony Mantha all need new deals, but for a rebuilding squad that just had one of the best drafts in the league, signing veteran names to short-term deals that could be moved at the deadline is a solid plan. According to The Athletic’s Craig Custance, the Detroit Red Wings have special interest in four unrestricted free agents: goaltender Robin Lehner, center Valtteri Filppula, winger Thomas Vanek, and defenseman Mike Green. What all four of these players have in common is that the Red Wings have a very specific role in mind for each player. Detroit is seeking to replace, or in some case retain, players who had success in a certain organizational role. Lehner, 26, appears to be a priority for the Red Wings. The former Buffalo Sabres starter reportedly visited Detroit today to meet with the Red Wings’ front office and coaching staff. Custance points out that Lehner is still young enough that he could get his game back on track and step into the starter role if and when 34-year-old Jimmy Howard leaves when his contract expires after next season. This was the exact role that the team had planned for Petr Mrazek, ironically the other big-name non-qualified goaltender. Mrazek was ahead of schedule and took Howard’s job for much of 2015-16 and 2016-17, but a drop-off in his performance eventually ran him out of town. The Wings seem to now see Lehner as a second chance at their plan, replacing Mrazek in hopes of landing a young heir apparent behind Howard. Filppula is a name that Red Wings’ fans are familiar with. The veteran pivot was drafted by the team back in 2002 and spent eight seasons in Detroit. Who better than a wise, capable long-time Red Wing to replace a wise, capable long-time Red Wing? Custance writes that Detroit is worried that injuries may keep Henrik Zetterberg from returning this season and pursuing Fippula gives them a back-up option if their seasoned leader isn’t around. Both players are versatile, two-way centermen who can help the team in many ways. Even if Zetterberg is healthy, Filppula’s return to Detroit could help to groom some of their younger talent. Vanek and Green are interesting targets in that the Red Wings want them back to avoid having to find another way to replace them. Vanek scored 38 points in 48 games with Detroit in 2016-17, but was traded to the Florida Panthers at the deadline. Almost immediately it was rumored that the Red Wings hoped to bring him back as a free agent. Instead, Vanek signed with the Vancouver Canucks and again was a deadline acquisition, this time by the Columbus Blue Jackets. 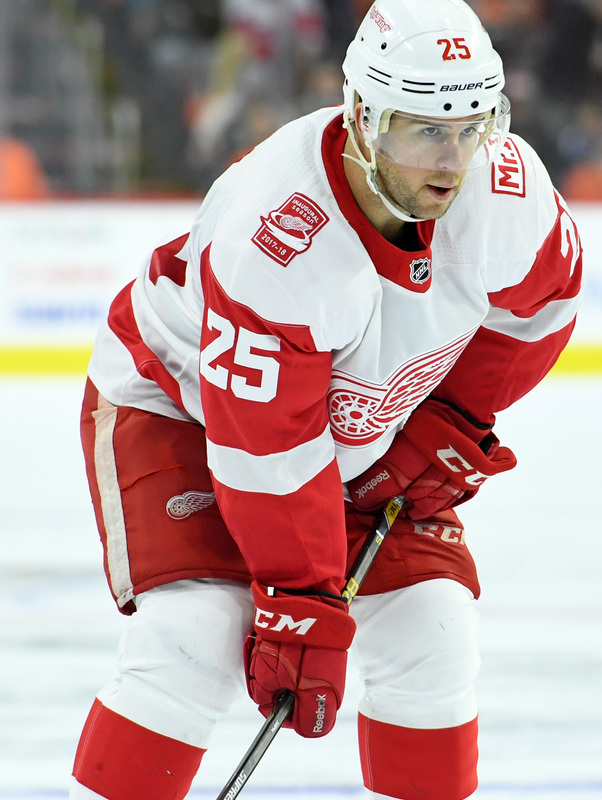 While Vanek registered 56 points in 80 games, Detroit struggled to make up his production. They are now back in the running for his services this off-season in hopes that he can again provide a spark on offense. They are also trying to avoid losing Green and, like Vanek, immediately regretting the loss due to a difficulty in replacing his ability. Green is the lone high-end offensive defenseman on the free agent market and Detroit is far from the only team in the running. Custance reports that they are willing to match salary, but won’t seem to budge on a maximum two-year term. If the Red Wings were to lose Green to free agency, they would surely have a hard time making up his 30+ points and more than 22 minutes of ice time per game over the past two seasons. The Red Wings have not been a strong team for the past few years, but there have been some facets of their game play that have worked out well. Detroit is hoping to continue, replace, or revive those successful pieces in hopes of finally returning to a complete, competitive team. Are Lehner, Filppula, Vanek, and Green the right moves? Or should the Red Wings forget about past successes and move on to a new, younger strategy? On top of being one of the teams that have shown interest in signing free agent winger Ilya Kovalchuk, the Red Wings also are interested in signing winger Thomas Vanek this summer, reports MLive’s Ansar Khan. Vanek spent most of the 2016-17 season with Detroit and fared quite well, recording 15 goals and 23 assists in 48 games before being shipped as a rental to Florida at the trade deadline. Vanek’s nomadic journey continued this past season and he could once again be in line for a one-year deal in free agency. Khan adds that the Red Wings has their eyes set on a pair of goalies that are soon set to hit the open market in Carter Hutton (St. Louis) and Anton Khudobin (Boston). Both netminders have shown that they are capable of handling more than the typical workload for a backup goalie which will come in handy given incumbent Jimmy Howard’s up-and-down performance over the last few years. In the same column, Khan provides the details for the contract offers that Detroit has on the table for pending UFA defenseman Mike Green. The Red Wings have pitched a one-year, $6MM offer which matches what he made in each of the past three years as well as a two-year, $10MM proposal. Green is slated to be one of the more prominent defenders on the open market this summer and is expected to be fully recovered from the cervical spine surgery he had back in April. Although there have been reports that the Sabres were expected to buy out winger Matt Moulson, Sabres GM Jason Botterill told Mike Harrington of The Buffalo News that the team does not have any interest in buying anyone out at the moment. Moulson has one year remaining on his contract with a $5MM cap hit and spent most of 2017-18 in the minors on loan to the Kings’ AHL affiliate in Ontario. While a buyout would save Buffalo some cap room this season compared to putting him in the minors, it would also create a cap charge of nearly $667K on their books for 2019-20. The Sabres have a lot of cap room at the moment so they may feel that they’re better off absorbing the higher cost for 2018-19 to get him off the books entirely instead of taking on the extra hit the following year. Speaking with reporters to discuss Friday’s trade, Canadiens GM Marc Bergevin stated (via Arpon Basu of The Athletic on Twitter) that they currently have no plans to buy anyone out. Montreal had several veterans that underachieved in 2017-18 but most are signed for at least the next two years which would make a buyout somewhat prohibitive long-term. Tampa Bay has yet to begin contract talks with pending RFA forward J.T. Miller, reports Joe Smith of The Athletic (Twitter link). Instead, it appears that discussions between the two sides will pick up at the draft. The 25-year-old has wrapped up his bridge contract, is coming off of a career season offensively, and has arbitration rights which put him in line for a sizable raise from the Lightning on the $2.75MM he made in each of the last two years. Free agency is now less than three weeks away, and all eyes are focused on John Tavares and John Carlson as the top prizes. Behind them though is another tier of quality players, including Detroit Red Wings defenseman Mike Green. Green, a former 30-goal, 70-point player from his days in Washington, is still an effective puck-moving option even as he heads into his mid-thirties. According to Craig Custance of The Athletic (subscription required) Green has been given two offers by the Red Wings to re-sign, of both the one- and two-year variety. That might not be enough to keep him around though, as there will be plenty of interest in the free agent when the negotiation period opens a few days after the draft. Green is coming off of a little bit of a quieter season by his standards but still a productive one as he recorded 33 points in 66 games. However, he wasn’t fully healthy heading into the trade deadline which scared off potential suitors. While he wound up returning briefly after the deadline, he was eventually shut down for the season and underwent cervical spine surgery back in April, one that carried a recovery time of two months. Those health issues may scare off some teams in free agency, as will his reputation in the defensive zone. While Green has made considerable strides since he was a young player, to get the most out of him still requires some sheltering. Teams that are looking to plug in a top-four defenseman that can do a little bit of everything might be a bit disappointed, though anyone in need of some offense from the blue line should be lining up to bring him aboard. The Red Wings need both of those things, but aren’t willing to commit to Green long-term as they enter a rebuild. It just doesn’t make much sense to sign an aging defender to a multi-year contract when the team is likely going to—if not outright aiming for a—finish near the bottom of the league and a reset on their salary structure and core players. If Green wants the security of a few seasons, he’ll have to find it elsewhere.